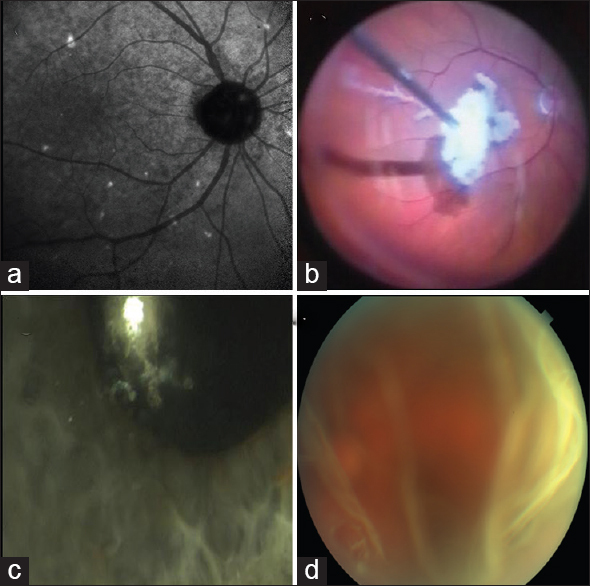 Pathological examination of material from a nonextensive pars plana vitrectomy (PPV) in the right eye provided a diagnosis of nonfamilial amyloidosis in a 68-year-old woman, who presented with bilateral glass wool-like vitreous opacities. Genetic testing revealed a Tyr114Cys mutation in the transthyretin gene. Six months after PPV, perimetry showed intense constriction with a temporal island and central scotoma in the right eye. An extensive PPV was performed in the left eye. Spectral domain optical coherence tomography evidenced bilateral epimacular amyloid deposits and unreported reflective spots within the inner retina. One year later, visual acuity had decreased to 20/400 in the left eye, with mild vitreous opacity, pale cupped optic disc and inferior altitudinal field defect. Bilateral diurnal intraocular pressure, transiently increased after PPV, never exceeded 16 mmHg with medication. Our patient presented optic nerve blood supply impairment, due to amyloidosis, which caused optic atrophy. Epiretinal and intraretinal deposit detection could aid in diagnosing patients with suspected amyloidosis. Amyloidosis is a rare condition, in which deposits of extracellular deposition of insoluble fibrillar proteins result in localized or systemic tissue damage. There are several types of inherited or acquired amyloidoses, one of which is caused by a mutation in the transthyretin (TTR) gene. The abnormal TTR protein is produced by the liver, choroid plexus and retinal pigment epithelium (RPE). Pathological investigation showed amyloid deposits on the conjunctiva, cornea, sclera, uveal tract, trabecular meshwork, vitreous body, , orbital tissues, and the optic nerve. Vitreous deposits and secondary glaucoma are the two major ocular complications of TTR-related familial amyloid polyneuropathy. A 68-year-old Caucasian woman, with a history of gastritis and light cerebral stroke with leptomeningeal involvement registered by magnetic resonance imaging (MRI), presented with bilateral glass wool-like vitreous opacities and whitish deposits mimicking lens fragments in the right eye. Ultrasonography showed no intraocular masses or retinochoroidal layer thickening. Fluorescein angiography revealed bilateral retinal vascular focal staining without ischemic areas and late hyperfluorescence of the optic disc. Indocyanine green angiography (ICGA) showed late diffuse hyperfluorescent spots overlying retinal vessels [[Figure 1]a]. Pathologic examination of amorphous material from a gastric mucosa biopsy and from a 23-gauge nonextensive pars plana vitrectomy (PPV) in the right eye [[Figure 1]b] showed positive Congo red staining [Figure 2] and confirmed the diagnosis of nonfamilial amyloidosis. Genetic testing revealed a Tyr114Cys mutation in the TTR gene. Extensive systemic diagnostic work-up ruled out plasma cell disorder and secondary amyloidosis; the patient was on antiplatelet therapy, her blood pressure and erythrocyte sedimentation rate were normal. One month after PPV, her right visual acuity had decreased from 20/25 to 20/50, due to recurrent vitreous opacities; her right intraocular pressure (IOP) had peaked at 29 mmHg and subsequently dropped to normal limits with 2% dorzolamide, 0.5% timolol and 0.2% brimonidine eye drops twice daily. Six months after PPV, thick grayish material consistent with amyloid deposit was found in the right anterior chamber [[Figure 1]c] and her right visual acuity had deteriorated to counting fingers within 8 weeks, along with moderate vitreous haze. Predominantly glass wool-like vitreous opacities [[Figure 1]d] required a 23-gauge extensive PPV with IOL implantation in the left eye. After 1 week, visual acuity in the left eye reached 20/25, IOP was 23 mmHg but dropped to 15 mmHg with the use of a fixed combination of 2% dorzolamide and 0.5% timolol. Spectral domain optical coherence tomography (SD-OCT) evidenced a bilateral epimacular layer of amyloid deposits and numerous reflective spots within the inner retina [[Figure 3]a and b]; average cup/disk (C/D) ratio was 0.89 and 0.44 in the right and left eye, respectively. Rim area was markedly reduced in the right eye and normal in the left; whereas only the retinal nerve fiber layer (RNFL) thickness in the left eye appeared reduced [[Figure 3]c]. Both eyes had temporal parapapillary atrophy. Perimetry (Humphrey-Zeiss 750 Field Analyzer) showed severe, mostly nasal, visual field constriction with central defect in the right eye (120 point screening), and mild depression in the left eye (MD - 4.9 dB, 30.2 program). Brain and orbit MRI was unremarkable. One year after PPV in the left eye, severe polyneuropathy, cognitive deterioration, and reversible ischemic neurologic deficit had occurred. Visual acuity was light perception in the right eye and, in 3 months, decreased to 20/400 in the left eye, where mild vitreous opacity, pale cupped (average C/D ratio 0.78) optic disc, inferior altitudinal defect with superonasal extension and central scotoma were found. Bilateral diurnal IOP, checked at bimonthly intervals, never exceeded 16 mmHg with medication. Outflow obstruction and raised episcleral pressure are possible mechanisms of secondary glaucoma, that usually develops about 2 years after the onset of pupillary amyloid deposition,  but in the right eye of our patient intraocular hypertension was discovered 6 months prior to amyloid material detection in the anterior chamber. The insidious severe visual acuity and field loss along with well-controlled IOP dictated against secondary glaucoma and was consistent with bilateral optic neuropathy from impaired blood flow in the optic nerve vasculature. In fact, in most pathologic specimens, amyloid deposits are localized in the vessels of the arterial circle of Zinn-Haller, ,,,,, the optic nerve sheaths and along the choriocapillaris. The neuroretinal rim loss and optic disc cupping, found in the right eye and afterwards in the left eye of our patient, indicate severe anterior and/or posterior vascular damage to the optic nerve. In our case, the visual loss developed in few weeks, and not over hours or days as typically described in acute anterior or posterior ischemic optic neuropathy. While late hyperfluorescence of the optic disc and retinal and choroidal vascular focal staining have already been described in ocular amyloidosis,  previously unreported bilateral hyperfluorescent spots found in our patient on ICGA likely correspond to small pinpoint opacities overlying retinal blood vessels, which may be overlooked as vitreous condensations on ophthalmoscopic examination. In our patient, epimacular amyloid deposits had a rather smooth and not a needle-shape appearance  on SD-OCT examination. She had minimally impaired visual acuity, shortly after complete left vitrectomy. Intraretinal amyloid deposits detection is a previously unreported finding in our patient, and indicates the route of amyloid material from RPE to vitreous chamber. Layered amyloid material caused unreliable measurement of the RNFL thickness in the right eye, where normal RNFL thickness was inconsistent with severe cupping and thinning of the neuroretinal rim. In our patient, both nonextensive and extensive PPV could not prevent the recurrence of bilateral intraocular amyloid deposits. Clinical evidence indicates that amyloidosis can cause bilateral sequential optic atrophy, reasonably due mostly to defective blood supply. SD-OCT can show RPE-derived intraretinal and epiretinal deposits and could provide helpful diagnostic hints in patients with suspicious TTR-related amyloidosis. Kivelä T, Tarkkanen A, Frangione B, Ghiso J, Haltia M. Ocular amyloid deposition in familial amyloidosis, Finnish: An analysis of native and variant gelsolin in Meretoja's syndrome. Invest Ophthalmol Vis Sci 1994;35:3759-69. Haraoka K, Ando Y, Ando E, Sandgren O, Hirata A, Nakamura M, et al. Amyloid deposition in ocular tissues of patients with familial amyloidotic polyneuropathy (FAP). Amyloid 2002;9:183-9. Taban M, Piva A, See RF, Sadun AA, Quiros PA. Review: Orbital amyloidosis. Ophthal Plast Reconstr Surg 2004;20:162-5. Biswas J, Badrinath SS, Rao NA. Primary nonfamilial amyloidosis of the vitreous. A light microscopic and ultrastructural study. Retina 1992;12:251-3. Kimura A, Ando E, Fukushima M, Koga T, Hirata A, Arimura K, et al. Secondary glaucoma in patients with familial amyloidotic polyneuropathy. Arch Ophthalmol 2003;121:351-6. Campos EC, Melato M, Manconi R, Antonutto G. Pathology of ocular tissues in amyloidosis. Ophthalmologica 1980;181:31-40. Beirão NM, Matos E, Beirão I, Costa PP, Torres P. Recurrence of vitreous amyloidosis and need of surgical reintervention in Portuguese patients with familial amyloidosis ATTR V30M. Retina 2011;31:1373-7. Koga T, Ando E, Hirata A, Fukushima M, Kimura A, Ando Y, et al. Vitreous opacities and outcome of vitreous surgery in patients with familial amyloidotic polyneuropathy. Am J Ophthalmol 2003;135:188-93. Kawaji T, Ando Y, Nakamura M, Yamashita T, Wakita M, Ando E, et al. Ocular amyloid angiopathy associated with familial amyloidotic polyneuropathy caused by amyloidogenic transthyretin Y114C. Ophthalmology 2005;112:2212. Hattori T, Shimada H, Yuzawa M, Kinukawa N, Fukuda T, Yasuda N. Needle-shaped deposits on retinal surface in a case of ocular amyloidosis. Eur J Ophthalmol 2008;18:473-5.